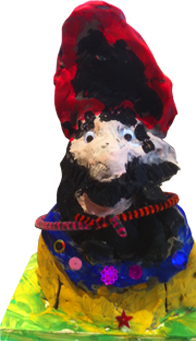 Inspirational Arts and Crafts Workshops for 5-11 year olds! You can hire us for Birthday Parties, Corporate Functions, Mini Workshops, Festivals, Christmas Parties, Weddings or any gathering where the children need to be kept busy! We are happy to fit around a particular party theme making paper mache or clay sculptures. Some of our most popular have been… Paper mache Animals, Self Portraits in Clay, Jewelled Mirrors, Exotic Birds and Tropical Fish, Star Wars Spaceships, Clay Dinosaurs, Fairies, Mermaids and Harry Potter Owls – all loved by both boys and girls! All prices include the cost of materials.